Grease a shallow, ovenproof dish. Place the chicken stock and sun-dried tomato paste in a small saucepan. Whisk to combine, then simmer gently over low heat. Heat the oil in a large pan, then add the onion and garlic. Cook over low heat until onion is softened. Add the rice and stir for 1 minute to coat the grains of rice in oil. Add the stock to the rice a ladleful at a time, stirring occasionally, waiting for all the stock to be absorbed before adding the next ladle. When all the stock has been absorbed, season well with salt and pepper. 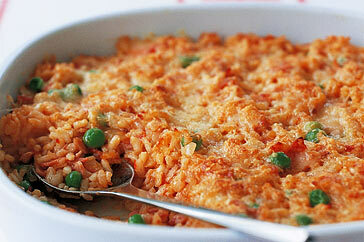 Stir in the ham and peas then place risotto in the dish and sprinkle with cheese. When ready to serve, dot with butter, then place under a hot grill until cheese has melted.